Governor Rick Perry has led a life of exceptional public service, starting in the United States Air Force and continuing to the governor’s office of our nation’s second largest state. He is a two-time Presidential candidate. 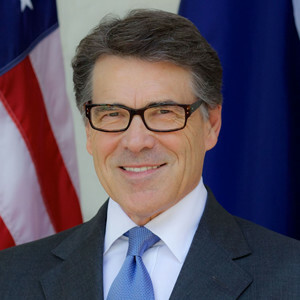 Governor Perry hails from Paint Creek, a small farming community north of Abilene. His father, Ray Perry, served as a Haskell County Commissioner, school board member and a World War II tail gunner. Between 1972 and 1977, Governor Perry served in the United States Air Force, flying C-130 tactical airlift aircraft in the U.S., Europe and the Middle East. Rick Perry’s political career started in 1985 as a representative for a rural West Texas district in the state House of Representatives. He was first elected to statewide office in 1990, and served as Texas Commissioner of Agriculture for two terms. Governor Perry’s administration focused on creating a Texas of opportunity and prosperity by improving education, securing the border and increasing economic development through classic conservative values. During his tenure, Governor Perry maintained a strong focus on fiscal discipline, becoming the only Texas governor since World War II to sign budgets that reduced general revenue spending. He used his line item veto to scrub more than $3 billion in budgeted spending, while encouraging investments in the building blocks of a prosperous state: the economy, education and security. The Texas economy thrived under Governor Perry, thanks to a focused effort to keep taxes low, regulations predictable and legal system fair. He led the effort to reform the legal system, signing into law a series of lawsuit reforms designed to stem the flow of frivolous lawsuits through Texas courts. As a result, Texas employers can devote their resources to creating jobs instead of defending against those frivolous lawsuits. More importantly, the reforms reversed the trend on skyrocketing malpractice insurance rates which has led to an influx of doctors seeking to practice in Texas. As a result, obstetricians and other specialists are returning to practice in previously underserved, high-risk areas. On the education front, Governor Perry worked to improve the quality of Texas schools from top to bottom by increasing accountability, raising expectations and funding programs that work. In addition to introducing the largest teacher incentive pay program in the country, Governor Perry oversaw a 43% increase in total spending on public education in Texas. He also signed a school finance reform package that provided a 33 % school property tax reduction, a $2,000 pay raise for teachers, record funding for classrooms and a reformed business tax. Stepping into the gap left by the federal government, Governor Perry worked closely with the Texas legislature to fund coordinated border security efforts to the tune of more than $230 million over the last several years of his Administration. He initiated a “boots on the ground” strategy, integrating and coordinating local, county, state and federal law enforcement efforts, resulting in significantly decreased crime in key areas along the border. Rick Perry is an eagle scout and a lifetime member of American Legion Post #75. He is married to Anita Perry and has two grown children, Sydney Perry and Griffin Perry.